Haruspicy was the method of divination used by, amongst others, the Etruscans (a civilization of ancient Italy in the area corresponding roughly to Tuscany). The seer — called a "Haruspex" from hira (entrails) + specere (to look at) — would read the entrails of animal sacrifices to predict the future. 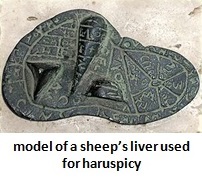 The liver was the popular organ of choice in haruspicy. Haruspicy is not original to the Etruscans nor the Romans. It is thought to have originated in the Near East, where the Hittites (a civilization from approximately present-day Syria and Lebanon) and Babylonians (present-day Iraq) performed similar rites with entrails. Why a sheep's liver? Whilst the answer to this is unknown, it is probably a combination of sheep being cheaper than cattle and a sheep's liver being relatively easy to extract (it's close to the abdominal surface). A sheep's liver is also relatively flawless, meaning that anomalies were easy to spot. The liver's role in purifying blood (which was known to be key to life) may also have been a factor.